Many cultivated plants can trace their roots to common roadside wildflowers and gardeners often assume that the wild or native form is simply an escapee from someone's garden. Wildflowers are beloved little treasures that have inspired poets, artists and storytellers from around the world and learning to recognize them and preserving their declining habitat is something all gardeners should aspire to. Goldenrod has a bad reputation. Every autumn, millions of allergy sufferers blame this innocent plant for their sniffles and itchy, watery eyes. Little do they know that it is another plant causing their problems and the goldenrod is in fact, innocent. It blooms at the same time that the evil ragweed (Ambrosia sp.) 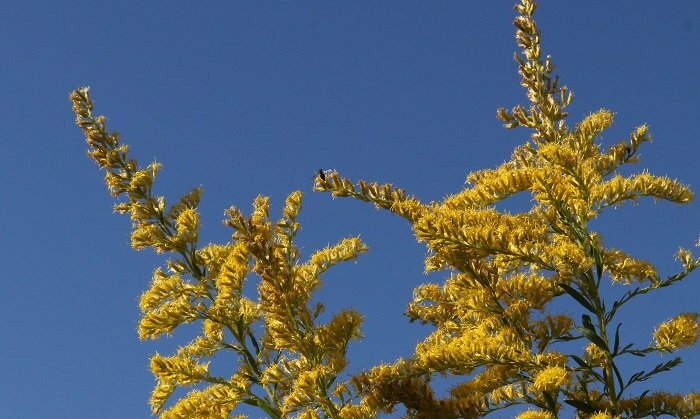 does and unlike ragweed, goldenrod's pollen isn't wind-borne. Goldenrod's pollen is far too heavy and sticky to float on the breezes, but ragweed can, and does. So, let's get that urban legend out of the way first thing. This beautiful late-blooming plant belongs to the Solidago genus, which are mostly native to North and South America. There are a few Eurasian native species, but the vast majority of these plants are from the New World. At one time it was an important plant used by native peoples and pioneers alike. Goldenrod's Latin name Solidago can be broken down like this: solidus (whole) and -ago (being or becoming). 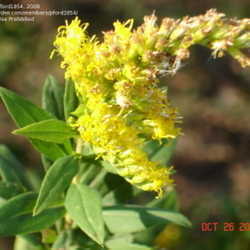 This is probably indicating the plant's medicinal uses, as Solidago species were used at one time to treat ailments ranging from sore throats to kidney issues. It has antibacterial and antifungal properties and the tea was often used to treat urinary tract disorders and skin ailments. It has a flavor similar to pine and pairs well with honey. When harvesting, cut the heads before they reach full bloom. If fully mature heads are harvested, they will just fluff and go to seed. 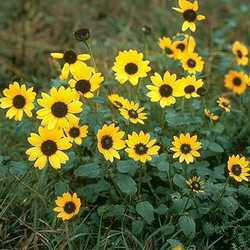 The leaves, flowers and stems are used in medicinal teas, but remember to use any herbal medicine or tea with caution. Even though there are no known toxic properties of goldenrod, everyone's tolerance for the unknown is different. The flowers also produces a lovely and permanent yellow dye that crafts people consider exceptional. The young leaves without the flowers produce a light green color that works well with a number of other colors. Another interesting note is that that goldenrod produces a rubber-like sap that can be commercially harvested and in fact, at one time Henry Ford was leading the research. The first Model-T cars had tires made from goldenrod rubber. Perhaps we should re-visit this idea since we're trying to reduce our dependence on petrochemical products. Europeans have embraced goldenrod and it is often seen in their gardens, but those of us on this side of the Pond have not been as quick to accept it. Our native Solidagos are somewhat thuggish and can easily take over a garden bed via the underground stolons that creep outward from the parent plant. They produce thick mats of roots that are hard to remove. However, plant breeders have developed varieties that are much more polite and less likely to wear out their welcome. So check with your local nursery to see which ones are recommended for your area. Or, if you have a hillside or bank that tends to wash in heavy rains, goldenrod may be a good choice to prevent erosion. The combination of ditch lilies and goldenrod would produce a colorful display for most of the season and hold the soil in place if you wanted to use the wildings instead of commercial plantings. Goldenrod is an important source of nectar and pollen for late season insects. Since it withstands drought conditions well, many insects depend on it during a time of year when food sources may be scarce. 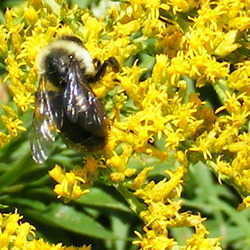 Even honeybees like its pollen and it is said that goldenrod honey is exceptional. It is a host plant for several butterfly species, especially the Checkerspots (Euphydryas sp.) and the blooms are often covered in a number of various insect and spider predators laying in wait for a potential victim. Some gardeners have noted that insects and pollinators prefer the native, wild species to the more cultivated commercial offerings, indicating that the pollen or nectar may not be as plentiful in the hybrid varieties. So, choose your plants carefully. If you are simply wanting something decorative, the commercial cultivars should be fine, but if you are creating pollinator and butterfly habitat, choose the species versions. Solidagos are pretty tough, so if you're concerned about unwanted spread, try planting it in a container. This would combat its aggressive tenancies like one would do for plants in the mint family. Deadhead the blossoms after blooming to prevent unwanted seedlings, because the Solidago genus is part of the larger Asteraceae family and like its cousins, goldenrod produces vast quantities of seed, each with its own little floating parachute. This bright native pairs well with other autumn bloomers and makes a stunning backdrop for plants like Asters and Eutrochiums (Joe Pye Weed.) If you have a sunny, well-drained spot and like native plants, try some goldenrod. Your bees and butterflies will thank you.